This past weekend saw a lot of bird activity. Canada geese resumed their northward flights in giant V-formations. The sound of them coaxing each other further on is delightful! Rarely do we get to hear such natural communication by wild creatures as we sit on the back porch. Other birds were seen and heard in action, especially the bluebirds calling for mates and taking turns standing on the bluebird nesting box. There have been a small group of bluebirds appearing here and there for a few weeks now. 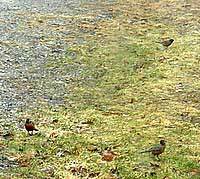 Here’s another true sign of Spring, a few robins searching the ground for a meal. The first robin of the season was spotted last Thursday. Since then we have been having quite warm, but windy and rainy weather. The last few days have reached into the 60s and the nights very mild in the 40s and 50s. Forecasts call for more blustery skies early in the week, so nature walks for flower pictures are on hold until the skies are partially clear and the wind is a bit more calm. Taking a nature walk, hiking your favorite trail, driving to work, walking on campus, or taking your child to the bus stop are all opportunities to see what is blooming in your neighborhood. As you go about your daily business do take time to stop, look and listen! Chances are that you will see something new, or something that you never noticed before. Even though I have walked around my wooded property many, many times, I still notice new things as the seasons change. Yesterday, I took notice of a small hemlock tree that I had never really observed before. The tree was small, for a hemlock, only about 12 feet high. 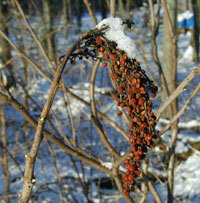 It was being crowded by some witch hazel and white pine trees. Since the hemlock was not very close to any large, mature trees, I decided to give it a little more space by cutting down the white pines next to it. The witch hazels I left in place as they would not grow much taller for they are understory trees in our eastern woodlands. However, I have made a note to myself to check on their growth this year to judge if they may be crowding the little hemlock. After all, the eastern hemlock tree, Tsuga canadensis (L.) Carr., is the state tree of Pennsylvania. I think it fitting to protect and encourage the growth of a beautiful specimen of this stately tree. Looking out the kitchen window on the ice-covered trees as I made coffee, I thought that I must get some pictures of the thousand lights blinking back at me. The early morning sun reflecting in each drop of frozen water made a starry scene of blue and white bright twinkling lights on the frozen vegetation. Will my little red azalea ever come back to life? Surely the white pine boughs will spring back up when the ice melts away. Well, if anything is true of late Winter it is that the weather is quite unpredictable. Last night an inch of light, fluffy, very dry snow covered everything. It was the kind of snow that squeaks when you walk on it. About mid-day most of the snow was gone, except for the shady areas. So, Spring is not quite here yet and Mother Nature is making sure we are paying her attention. I captured a few snowy pictures, but the one I like the best is this image of last year’s sumac with a top coating of snow. The raspberry vines that I said were already sprouting yesterday, are not vines at all. I was mistaken for it appears to be a sassafras stem that has started to sprout. Time will tell for sure and I will update this when the leaves finally show themselves. Spring is not far away! Two days ago I spotted my first signs of Spring. I figured the lilies that poked through the ground a week ago next to the house didn’t really count, but when I saw the raspberry buds pushing out on Saturday I knew that the mild Winter was probably going to trade off with an early Spring. I could not see a flock of Canada Geese flying North, but I certainly did hear them as they coached each other to their frozen destination. A cold front was coming in later in the day and we were still on the warm side of it when the geese flew overhead. Wind blew hard that night the cold front came in and, again, we lost our electricity for a few hours until the winds died back.